I’ve got a sketch challenge for you today! I have quite a few that I need to catch up on (again) so you will be seeing several sketch challenge cards in the near future. Take a look at this fun holiday card! I started off with a piece of Crumb Cake card stock cut at 5-1/5” x 8-1/2” and scored it at 4-1/4”. I cut a piece of Early Espresso Coredinations card stock 4” x 5-1/4” and ran it through the Big Shot in the Snow Burst embossing folder. I used the handy dandy little sanding block to lightly sand the raised portion of the texture and then adhered this piece onto the card front. Next I cut a piece of Whisper White card stock 2-1/4” x 3-1/4”. I stamped the greeting from More Merry Messages onto the bottom of the card stock in Cherry Cobbler ink. Then I adhered this panel onto a 2-3/8” x 3-7/8” Cherry Cobbler card stock. 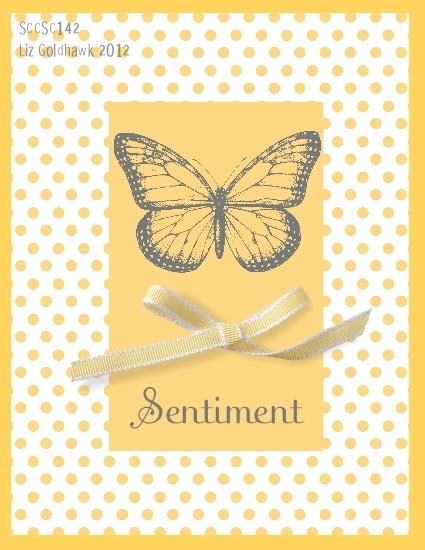 I wrapped the panel with a piece of Crumb Cake taffeta ribbon and tied it into a bow then adhered the panel onto the card front with a few Stampin’ Dimensionals. 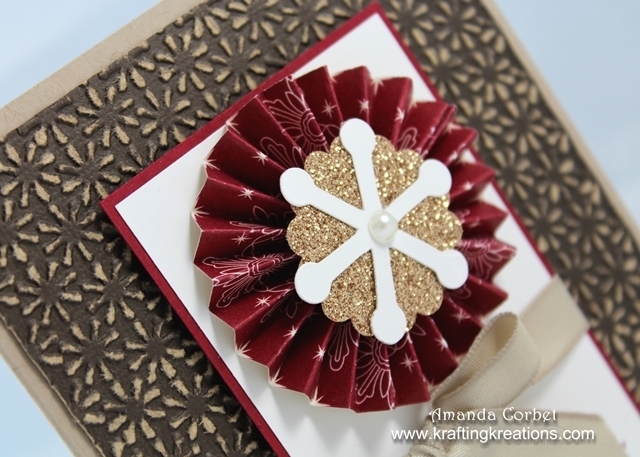 I had the rosette left over from a sample I was making for a class. It was too big for what I wanted to use it for so I just tossed in my scrap bin. Now it has a new home! To make the rosette I cut a piece of Candlelight Christmas DSP 1” wide and scored it every 1/4”. I folded it accordion style and glued one end to the other to create a large circle of zig-zag paper. Then you just push the top edge of the paper so it is laying on the table, carefully hold it tight in the center, and apply hot glue on the ends. (Maybe I should just make a tutorial for this). Next I used the 1-1/4” Scalloped Circle punch on a piece of Champagne Glimmer Paper and used a little more hot glue to glue it onto the rosette. 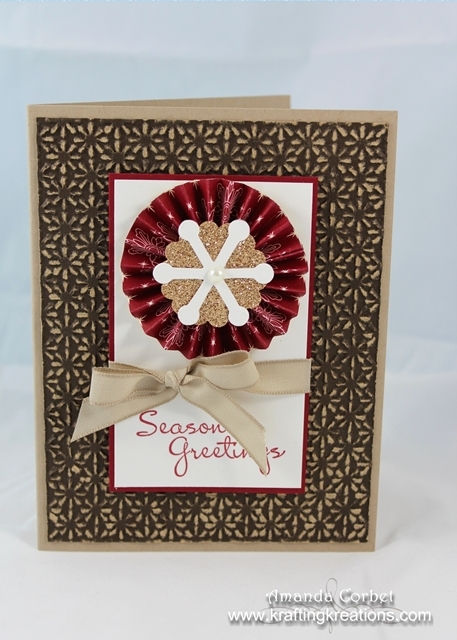 The snowflake was cut with the Snow Flurry Die and adhered on top of the glimmer paper with Multipurpose Liquid Glue and a large pearl was added in the center of the snowflake. To adhere the rosette onto the Whisper White card stock I just applied a generous amount of Multipurpose Liquid Glue onto the card stock, placed the rosette on top, and left it to dry for about 20 minutes. I wanted to make sure that it wasn’t going to fall off. Now this card is too thick to send in the mail, but would be a great accent to a hand-delivered Christmas gift!